I’ve just finished making a presentation at a conference in London entitled “Cost-Effective E-Communications, Social Networking & Blogging” organised by Haymarket (linked to ThirdSector magazine). All the speakers in the morning have been explaining in depth how it’s vital to be honest, fair and open when using social media. Well – conference organisers – the same applies to you too. First of all it’s been a complete hassle to even be able to attend the conference. I made the trip from Brussels to attend, footing the cost of my own ticket. The problem was that – as I work partly as a website designer – the conference organisers initially wanted to charge me – yes, charge me – to allow me to make a presentation about the atheist bus campaign. He’ll make business out of it was their fear I suppose. The proposed deal? £1900 + VAT that I would have to pay to make a presentation about a campaign that has massively cost me in terms of time and money. I’m just a volunteer for the atheist bus campaign, and I cover all the costs of the hosting of the sites myself, and I’m supposed to pay to make a presentation about it? Surely they should want me to make a presentation? I know how the tech worked, so I’m uniquely qualified to speak about it, and it’s one of the biggest NGO campaigns in the UK in recent times, it’s a value to their programme to have a presentation about it. In the end the organisers repented, so I have not had to pay to make the presentation. But I had to agree to not give out any business cards, and not put my e-mail address or URL on the presentation. I also tried to avoid even talking to anyone while there. When I arrived at the conference I found that even my name has been blanked out; in the programme I was ‘Campaign Partner’ not ‘Jon Worth’, my name was not listed on the attendees list, and they even stripped my name out of the Powerpoint presentation I was to give – and I’m the one who actually designed the presentation! 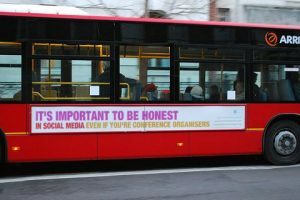 Essentially the very reason why the atheist bus campaign was such a resounding success was because we were good to people, we were not petty with regard to how we used our text, our images – everyone was free to use everything, the more the merrier. It generated that community feeling that is so vital for the overall success of the campaign, in fact central to the success of any social media campaign. Oh how much it annoys me that the organisers of a conference about blogging cannot – even in some small way – manage to see that! A similar presentation is now online here. Yes! Will do when I find a moment… I’ve been teaching all day today, and only got back to Brussels super late yesterday. Will put it there sometime later tonight, if not then tomorrow. Apologies! Why don’t you upload the slides to SlideShare.net (with your name included!) – chances are more people will see the presentation there than managed to attend the talk. Thanks for the replies! I’ll get the main conclusions from the presentation online shortly. Was really disappointed to miss your presentation – sounds like I missed a good one. What on earth were they thinking? Well you were certainly one of the best speakers of the day, if that’s any consolation. Why on earth did you agree to speak on those degrading terms?